That same fly—those specialized structures, known as "halteres," now surgically removed—takes off again, but immediately begins to tumble wildly about, unable to right herself or tell up from down, side from side. Case Western Reserve University's Alexandra Yarger, a Ph.D. candidate in biology and first author on a new paper published in September in the journal Proceedings of the Royal Society B, has some of the answers to those questions. Yarger gained much of her insight by essentially taking over the operation of the haltere for several species of common flies: flesh flies, black flies and hoverflies. 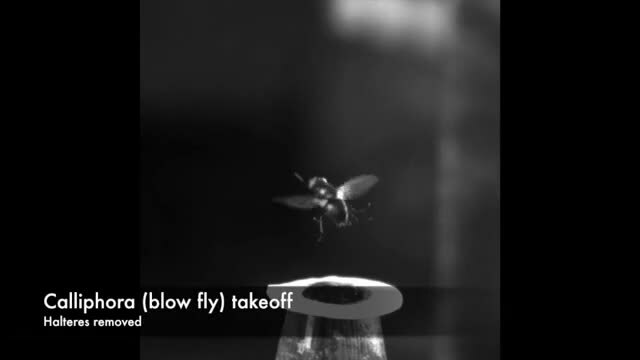 She glued a bit of metal to the tip of each fly's haltere and then manipulated it with a small magnet to simulate a change in orientation during flight and then recorded the electrical signals it generated—essentially a code sent "downstream" to the muscles make the fly a better flier than other insects. "We know that the halteres activate the neurons, which in turn, tell their wings and neck what to do—but no one really knew exactly how that happened until now," said Yarger, who worked on the project over a period of about two years, beginning in 2016. But Pringle did have two related thoughts—that either some neurons that didn't fire when the fly was flying straight would start firing when the fly rotated; or that some neurons might change the timing of when they fire when the fly rotates, Fox said. which was once a second set of wings, but transformed by millions of years of evolution into what serves as the unseen balancing system. Oh, PLEASE MAN, spare us this kind of non-science!!!!!!! Here you have an absolutely amazing balancing system that out performs anything mankind has created till now, set in a minute structure that defies belief and she goes off on a loose limb to declare the wonderful abilities of the evolutionary god to design such things. They clearly see that code is involved. Which means that somewhere decoding has to occur. Which means that some intelligence was involved in creating the meaning between the coding and decoding phases. There is no other explanation for how an ABSTRACT entity can arise via purely random materialistic processes. Get real. Your definition of non-science is wrong, Fred. ... and your thoughts on coding and decoding too. @Ojorf: I suppose you can show how they applied the scientific method to extricate the knowledge of "millions of years of evolution" , right? If not, then their statement is simply a homage to the evolutionary god. Pure none-science. As for coding and decoding - these mechanisms have an underlying meaning attached to them, so your statement is simply vacuous unless of course you'd like to expound on how my thoughts are wrong. It would be instructive to see how you get abstract entities from purely materialistic processes. That is something I'd like to behold. So how did it fly in the meantime? How did it manage to survive for those millions of years without the ability to fly? Well freddyboy, you do have an interesting question there. "... So how did it fly in the meantime? How did it manage to survive for those millions of years without the ability to fly?..." I would imagine it was by the same method your caretakers use, holding your hand firmly to cross a street. Do that over a few hundred milliom years and maybe even you could learn how to safely cross a busy intersection without assistance? Ridiculous. Look where you are writing, this is a science site and that is an article on peer reviewed science. Besides, it is basic biology. Besides, you instead try to insert irrelevancies such as religion. somewhere decoding has to occur. So how did it fly in the meantime? Why this trivial question? "It" did not fly, but its ancestors flew, since this lineage did not loose flight. The rest is in the article and paper. The neuronal code is decoded in the fly brain obviously, for which it was "coded" (signaled) in the first place. Why this trivial question? "It" did not fly then, this is an evolved trait, but its ancestors flew (and remotely enough they flew differently, hence the evolutionary change from two wing pairs to 1 pair + halteres derived from the modified pair), since this lineage did not loose flight. The rest is in the article and paper.